Grew up with AB Siauliai (Lithuania) juniors. Made his debut with AB Siauliai during the 1997-98 season. Played college basketball at University of Arizona (1999-00). On January '00 left the team. Back to Lithuania signed by Lietuvos rytas Vilnius. Signed for the 2009-10 season by BC Khimki Moscow. .moved to Spain for the 2010-11 season, signed by Valencia CB. .back to Lithuania for the 2011-12 season, signed by BC Zalgiris Kaunas. Named the 2005 ULEB Cup Final MVP. Played at the 2001, 2005, 2009 and 2011 European Championships. Played at the 2004, 2008 and 2016 Olympic Games. Won the 1999-00, 2001-02 and 2005-06 Lithuanian National Championship with Lietuvos rytas Vilnius. Won the 2011-12, 2012-13, 2013-14, 2014-15, 2015-16 and 2016-17 Lithuanian National Championship with BC Zalgiris Kaunas. Won the 2012, 2015 and 2017 Lithuanian National Cup with BC Zalgiris Kaunas. Won the 2006 Baltic League with Lietuvos rytas Vilnius. Won the 2012 Baltic League with BC Zalgiris Kaunas. Played the 2001, 2002, 2004, 2005, 2006 and 2012 Lithuanian All-Star Game. Named the 2002 Lithuanian All Star Game MVP. Won the 2001 Lithuanian All Star Game Slam Dunk Contest. Led the 2006 Baltic League in blocking (2.3 bpg.). 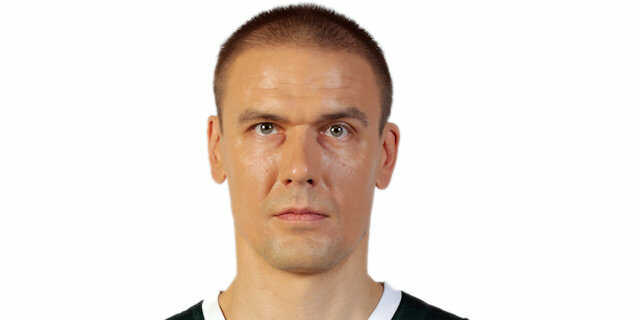 Led the 2005-06 Lithuanian League in blocking (2.4 bpg. ).